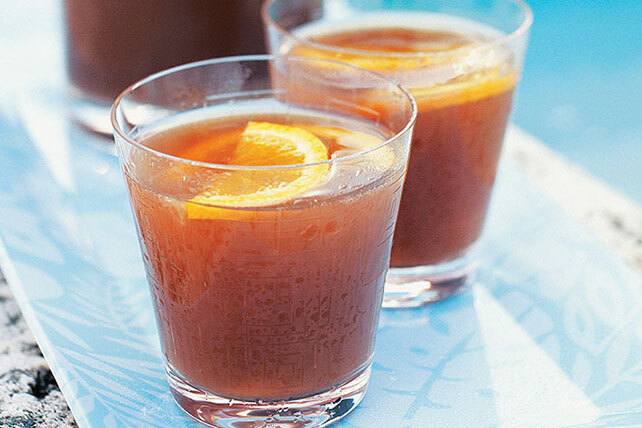 Serve this bracing Spiked Peach Iced Tea with fragrant orange slices. This spiked peach iced tea is made with bourbon and orange juice. Empty contents of drink mix packet into large plastic or glass pitcher. Add water, orange juice and bourbon; stir until drink mix is completely dissolved. Add orange slice to each glass. Great way to stay cool with this adult drink. Prepare as directed, using CRYSTAL LIGHT Red Ruby Flavor Drink Mix. To make a non-alcohol version of this drink, omit the bourbon and increase the orange juice to 1-1/2 cups.